Third-party apps have started to become the best-in-class in iOS. This is good for third-party developers, users, and in the short-term, Apple. It gives third-parties, like Google, additional exposure and revenue. It provides better apps for users on iOS devices. And it helps sell more iOS devices for Apple. In the long-term, however, it may not work out so well for Apple. Many people fail to see the problem with high quality third-party apps. These people are partially correct - the apps aren't the problem. Instead, Apple's policy towards third-party apps and lack of innovation in its own apps create the problems. First, Apple won't allow you set third-party apps as default in iOS. When it comes down to it, iOS devices are just computers. Imagine not being able to set a default third-party mail app or browser in OS X. That would never be acceptable, and it shouldn't be acceptable in iOS. The only reason it hasn't created bigger problems thus far is because Apple's apps have been sufficient for the majority of users. There also haven't been many compelling alternatives. Until now. This brings us to a second problem. 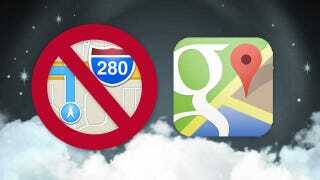 With the launch of Gmail, Google Maps, and Chrome, Google is beginning to offer better iOS apps than Apple. Other apps, such as Sparrow or Fantastical are also strong alternatives Apple's offerings. The lack of a default setting makes the experience less than ideal for users, with iOS forcing you to use Apple's apps in certain situations. Over time, some people may decide that it's easier and more seamless to use an Android device than use a bunch of Google apps on an iPhone. Year after year, Apple touts the integration of apps into iOS as new features, which are unavailable if you use third-party apps. If your core apps of choice are from third-parties and iOS creates friction when using them, people will become frustrated and eventually look at other options. Apple isn't without solutions, however. I see two options and, ideally, both will happen. First, Apple needs to improve its core apps at a pace equal to or faster than third-party apps. Second, Apple needs to allow users to select third-party apps as default. If one or both of these things don't occur, Apple will eventually begin to lose users who prefer third-party apps, such as Google's, in a seamless, integrated, experience. With some simple changes to iOS and its policies, Apple can turn the iPhone into an even better, and more dominant, mobile platform. However, a stubborn stance could result in a clunky, poor, user experience that will begin to drive away users. Virtual Pants is a column that provides commentary and unique insight on the latest technology news. You will find viewpoints there that aren't expressed by others in the tech blogosphere.